The NIV APPLICATION COMMENTARY 1 & 2 CHRONICLES applies these books to twenty-first-century culture by bringing the lenses of historical awareness, literary appreciation, and a biblical-theological perspective to bear on the Chronicler's sermons. The Chronicles are more than a history of ancient Israel under the ascent and rule of the Davidic dynasty. They are a story whose grand theme is hope. Great battles are fought, heroes and tyrants vie for power, Israel splits into rival kingdoms, and the soul of God's holy nation oscillates between faithlessness and revival. Yet above this tossing sea of human events, God's covenant promises reign untroubled and supreme. First and Second Chronicles are a narrative steeped in the best and worst of the human heart,but they are also a revelation of Yahweh at work, forwarding his purposes in the midst of fallible people. God has a plan to which he is committed. Today, as then, God redirects our vision from our circumstances in this turbulent world to the surety of his kingdom, and to himself as our source of confidence and peace. Exploring the links between the Bible and our own times, Andrew E. Hill shares perspectives on 1 and 2 Chronicles that reveal ageless truths for our twenty-first-century lives. Most Bible commentaries take us on a one-way trip from our world to the world of the Bible. But they leave us there, assuming that we can somehow make the return journey on our own. They focus on the original meaning of the passage but don't discuss its contemporary application. The information they offer is valuable,but the job is only half done! 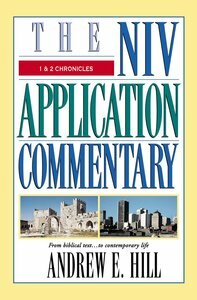 About "1 & 2 Chronicles (Niv Application Commentary Series)"